This is where the terrific VIP PETS meet and have their beautiful hair washed and brushed so they always look stunning. The salon comes with exclusive accessories and works with real water…. 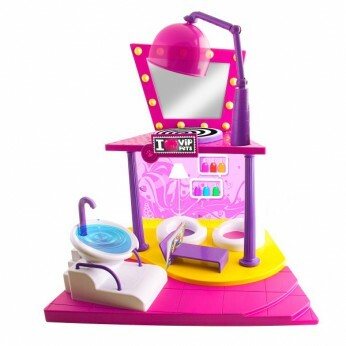 Check out the VIP Pets Beauty Salon playset, the place where all VIP Pets love to go to have their hair styled and chat to their friends! It works with real water! Style your VIP Pet’s long gorgeous hair; go on, show your flair! Visit the website www.ilovevippets.com; One supplied; Size H46, W30, D12cm; For ages 3 years and over; EAN: 8421134711020. WARNING(S): Not suitable for children under 3 years old. Only for domestic use; To be used under the direct supervision of an adult. Only to be used in water where the child is within its depth and under adult supervision. This toy costs approximately £19.99 (for the latest and best prices make sure you check our retailer list for the VIP Pets Beauty Salon Playset above). In our review of VIP Pets Beauty Salon Playset we classed it as being suitable for ages 5 years, 6 years, 7 years, 8 years but recommend you check the manufacturer specific advice before purchasing.